I'm pleased to say that the short-sleeved permutation of our highly popular Friday Polos are available again in the Permanent Style shop. It's been a year since these were available last - and like last time, only 100 have been made, so they're likely to sell quickly. The shirts are available in navy and light grey (again, like last time) and differ only from the regular Friday Polos in having short sleeves and a slightly shorter, squared-off bottom. This enables them to be worn pretty well either tucked in or tucked out. 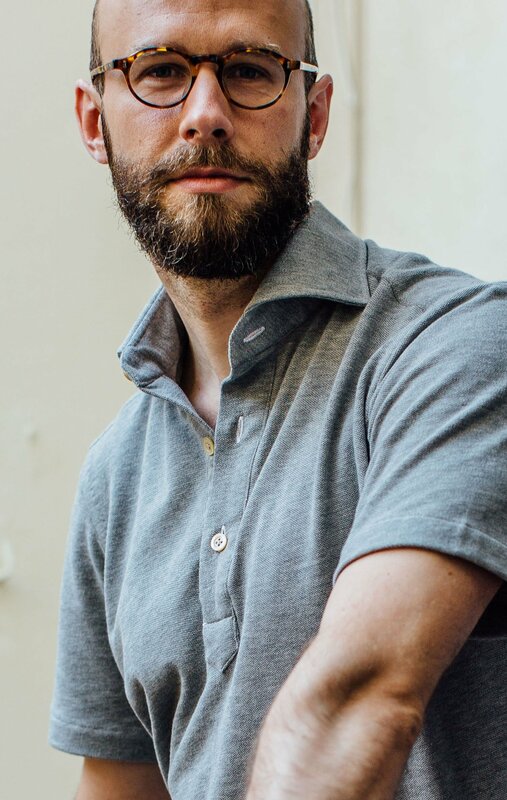 Friday Polos have been a perennial favourite on Permanent Style since they were launched in 2015, and frequently sell out within a few weeks of launch. The short-sleeve version has only been available once before, in July 2016. This year it has been produced earlier in the summer, in reaction to customer requests. The shirt was created to work perfectly with tailoring, and therefore has a high, two-piece collar and a hand-attached sleeve. 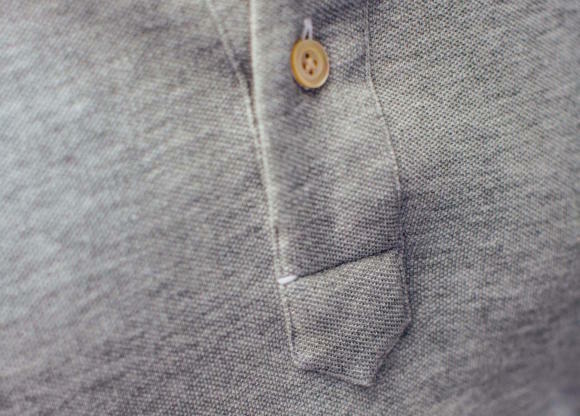 The short-sleeve version also has nice sartorial details like a simple turned-back finish to the sleeve - rather than the tight ribbing that other polos frequently use. 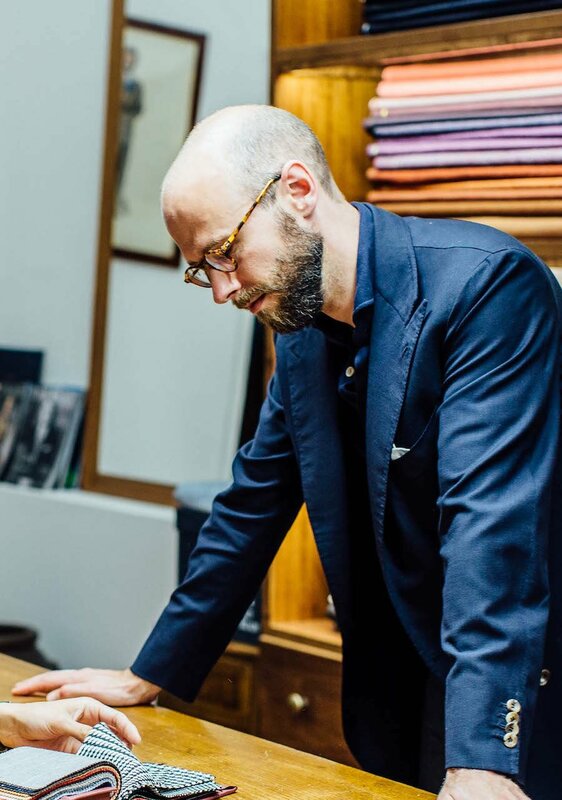 They are all made in Naples, in a workshop overseen by bespoke shirtmaker Luca Avitabile. We did consider changing the Caccioppoli pique cotton to a more traditional, thinner version, but the samples lacked the body and feel of the Friday Polo we love so much. I also tried last year's version on several hot days we've had in the UK so far this year, and didn't notice any significant difference from those samples. You can follow the discussion on Short-sleeve Friday Polos are back! by entering your email address in the box below. You will then receive an email every time a new comment is added. These will also contain a link to a page where you can stop the alerts, and remove all of your related data from the site. When are we scheduled to head more about the Liverano? Excellent. I love the long sleeved one I have; everything about these shirts is so much better than the standard, thin pique polos you see (very often with a hefty price tag from the ‘designer’). All we need now, Simon are a few of those hot days you recall from last year – must have missed those. Is tucked out a phrase rather than untucked? Would really like one but unfortunately your sizing doesn’t cater for the “portly” amongst us. I’ve wondered the same thing regarding the proper usage of “tucked”, though not to make fun of course. Learning about the logic behind “untucked” has changed my perception so much that hearing “tucked out” just sounds odd to me even when I used to use that like everyone else. To each his own, perhaps? Is the £150 inclusive of VAT? Simon, are the polos you wear cut like your shirts or a little slimmer because they stretch? RATS!!! No racing green. Still, it will not stop me from ordering one. Stats look to be pretty much same as LS Polos except shorter in body. Simon, when do you expect to send out 1st deliveries? And thanks for all the hard work! Thanks Brian, and sorry on the green. Is it your Caliendo Cotton Suit in the first picture? Just taken delivery of the grey and love it. 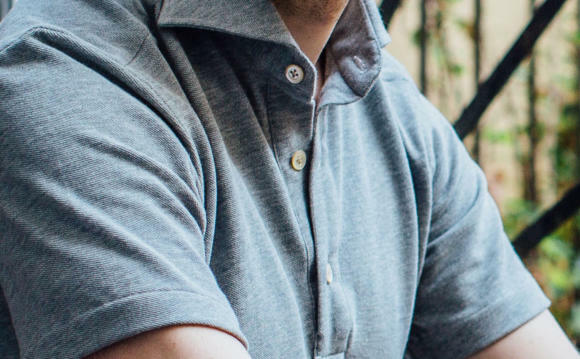 There is a lot to be said for bringing some thought and excellence to the classics – my PS polos are my most admired shirts because they look great and people can’t completely figure out why. Just don’t take any photos of guys smoking wearing one! I’m in love with these short sleeves Friday polos. They’re comfortable & perfect for every body type. Are these made in the same atelier / factory as Luca’s bespoke shirts? Looking forward to receive mine Monday. Ha! Delivery was quick wasn’t expecting them to arrive so quickly. Got both colors (no u btw) in Large. Nice job on these, it’s actually really hard to find nice polo shirts that aren’t messed up with a logo or some silly design choice. A collar that doesn’t go limp, hallelujah! Keep making these. Received my polo’s today – super quick delivery to the US. It’s my first foray into the “Friday polo”s” and all I can say is WOW! Super comfortable and great fit. Wonderful shirt. Any chance you’ll do a run of brown / green in the short sleeve model? white and green would be great. But another run of grey and navy would be cool too. Thanks again for doing these, decent polo shirts are actually pretty hard to find. I also received my short-sleeved polo today. Great shirt! I live along the coast in southeast North Carolina, so it is hot & humid here a good part of the year. You need not have any concerns that the mid-weight Caccioppoli pique-cotton fabric of this shirt might be too heavy for warm or hot summer days. The shirt which Simon designed and fabric selected is perfect. Unless during the winter, I do not like to be warm. This is a great summer shirt. Also to note, I usually take a medium shirt, but take a large in Simons creations. Do you have any plans to make short sleeved polos available again in the near future?